INSIGHTOVATION® Consulting | When was the last time you checked your mix of project types? When was the last time you checked your mix of project types? 27 Mar When was the last time you checked your mix of project types? Why identify your project types? Recognition that most organizations have a mix of different types of projects being worked on by product managers, R&D, engineering, marketing etc., is important to an organization’s productivity. Each project has a different role, scope and goal for the organization (although in many poorly managed portfolios it is sometimes unclear to see how some of them fit.) 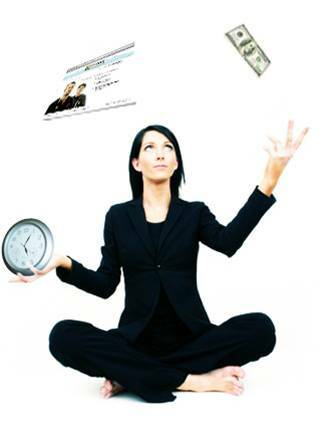 Each project requires different levels of staffing, resources and is on a different timeline. It is because of these differences that one should be aware of typical issues and requirements associated with managing each project type. Do you know the mix of your project types? My goal in this article is to provide a simple tool for mapping out your project types. To facilitate this discussion I pulled out a great little tool. It is a simple 2×2. In fact, a simple 2×2 is one of the best first steps for so many processes. This 2×2 will help you define the primary types of your development projects. It is easy to do and does not take long. It is also discussed in greater detail in the classic book by Wheelwright and Clark, Revolutionizing Product Development, © 1992. Let’s begin. A number of different dimensions could be used to classify your organization’s projects; however a particularly useful way to characterize projects is to use the dimensions of the “extent of change” the project represents. Consider the types of change that projects typically involve. One type of change is the extent of the product change. Another is the extent of the process change. Plot your projects on this type of grid to get a better understanding of the mix of project types. You can use the size of the bubble to communicate any number of attributes, such as net present value (NPV), capital expense, annualized sales or income etc. 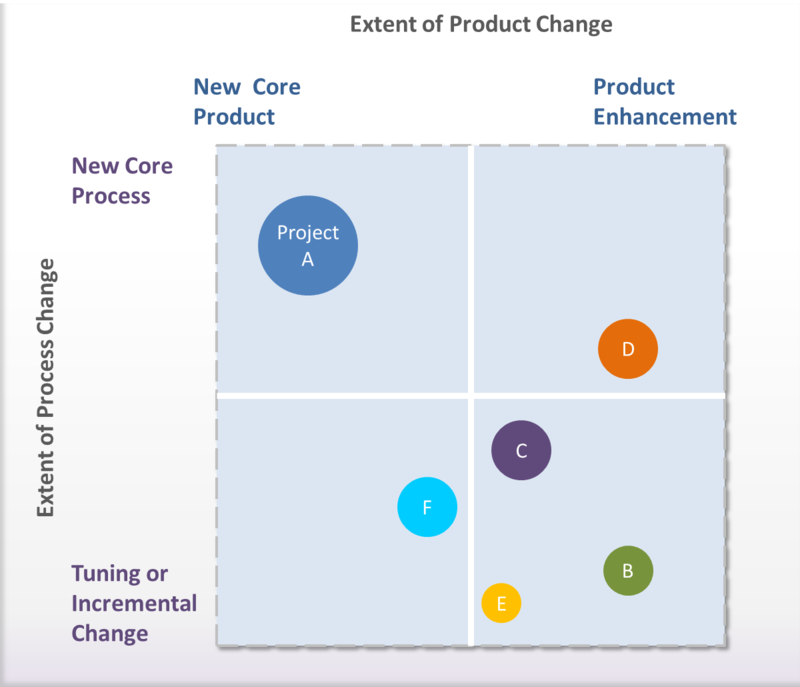 Once you have a plot of the mix of projects and where they are on a scale of change to current products and processes, they can be classified into three types. The three types of projects are derivatives, platform changes and radical breakthroughs. Classification of project types in this way may be important to because it clarifies thinking, planning, staffing, and providing a framework to aggregate projects into an overall plan since each project will need a different level of staffing and resource commitment. The project types also help point to the appropriate product and process maps that will be helpful to guide progress over time. What are the benefits of classifying projects by type? Knowing the difference between a platform change and a product derivative helps plan for the differences in front end planning required for a platform change. In a platform project there is a bundling of a number of improvements into a new system to provide the solution across a range of users or customer groups. In contrast, the derivative project may be in response to targeted requirements from a single subset of users or customers. By nature, the platform project represents more change and requires more activity, creativity, insight and development at the front end to be sure that the platform actually meets the critical to quality attributes and customer requirements across the board. It is also recognized that it is more challenging to converge on a solution for a platform project and the final product specs may be more complex that the previous solution. In a derivative project many of the issues have been already closed or are limited by earlier platform decisions. In addition, platform projects require deeper cross-functional involvement. Another consideration is that projects initiated to obtain radical breakthroughs often have a much longer period of upfront investment in research and development, and are much further out on the horizon. Skills and tools in advanced development are often required for radical innovation and breakthroughs, and the team assigned is often a separate part of the organization from those managing the current products and platforms. 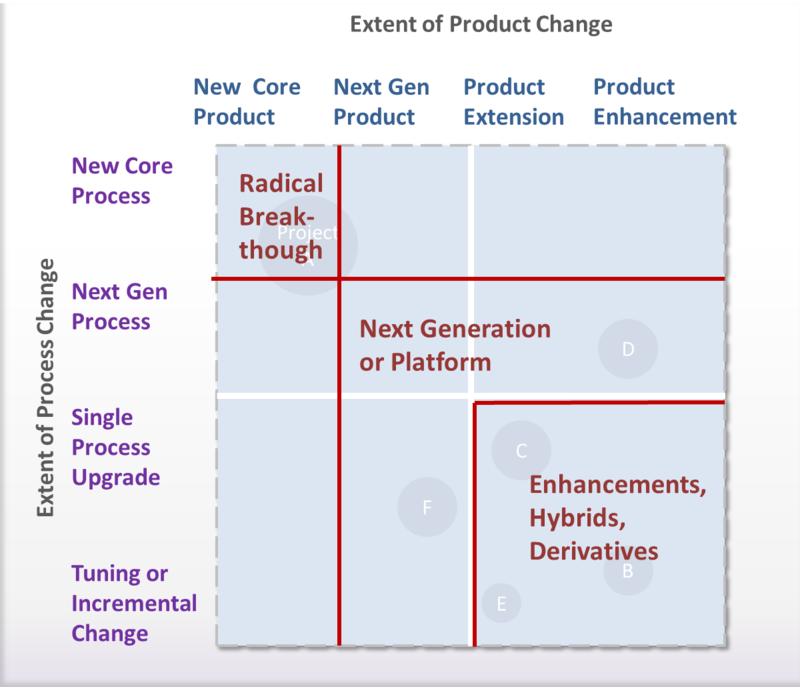 In order to allocate resources and provide sustainable growth, an organization needs to understand the mix of projects as it relates to product lifecycles and industry maturity. The timing of product derivatives, platform introductions and innovative breakthroughs are all important to the long term health of the business. It is also important to know the target mix of projects for executing a strategic plan within a preset period of time (usually is 3 -5 years for most organizations.) Note that radical breakthroughs may take as long as, or longer than, 10 years to commercialize. Though many of these strategic decisions are complex and rely heavily on data, skills, and tools used by a qualified team of professionals leading the organization, the complexity can be broken down into easy-to-understand components and built back up into a successful aggregate plan. Using a simple tool such as a plot of your project types is a simple way to start on the road to managing a portfolio of products and projects.